Since antiquity, plaster has been used to replicate art works, in particular sculptures in the round and reliefs. To this purpose a mold (negative) is taken from the object (positive). The mold can be made in different material such as wood, terracotta, plaster, or in our days, silicone rubber. This is the most complicated, work-intensive and expensive step in the production of a plaster cast. It requires real craftsmanship. The process of casting itself is much less work-intensive. The mold is filled with plaster powder dissolved in water. Once the plaster has hardened and the mold been removed, we face a 1:1 replica of the original. This process can be repeated numerous times with (almost) the same result. Plaster is a cheap material and hardens quickly. It therefore allows for a budget-priced serial production of precise replicas. These qualities were responsible for the success and popularity of the casts, but also for their demise. 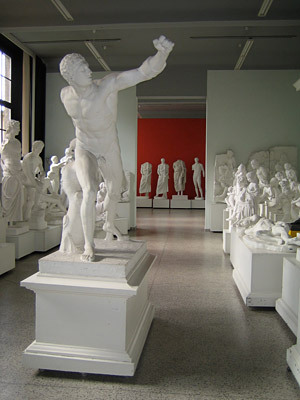 Plaster casts have been formative for many artistic movements such as Renaissance, Baroque or Neo-Classicism. From the 15th century on casts were part of private collections of scholars, artists, aristocrats and royals in Europe. The replicas constituted an early canon of what were considered masterworks of the ancient Greek and Roman world. The latter formed the basis for the establishment the royal or courtly academies of arts, the first of which were several precursors of the later Académie des Beaux-Arts founded in Paris in the second half of the 17th century. Casts enabled artists to study human anatomy and to learn "the idea of beauty." As models, casts also played an important role for the applied arts of the age of industrialization. Institutions such as the Victoria and Albert Museum in London were set up to educate and train the taste of the entire British nation. The low-budget prize of the casts paved their way into the homes of the petite bourgeoisie. The casts’ low prices also increased their availability for scholarly investigation in an academic context. The positivistic approach of the later 19th century praised the unifying and standardizing effects of the casts’ surface that facilitated comparison in formal analysis. The plaster guaranteed a faithful, or mechanically objective, one-to-one copy; the cast collections thus allowed for an equally objective reconstruction, comparison and classification of the ancient originals, which were housed by different collections throughout the world. As archaeologist Adolf Michaelis wrote in 1884: "such a (cast) museum is as necessary a supplement to archaeological lectures, as a laboratory is to lectures on physics or chemistry." 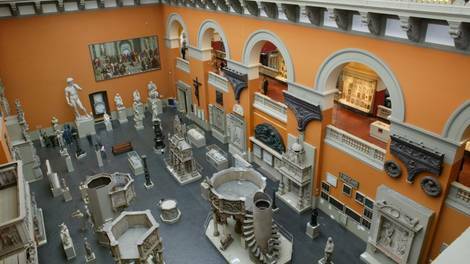 Museums in the 19th century with their encyclopedic agenda welcomed the casts since they offered the possibility to fill gaps in the collections. Large public art museums in the U.S., the motivation of which was primarily educational, at first relied totally on budget-friendly casts. In the early days of the Museum of Fine Arts in Boston, for example, trustees argued that it would cost too much money and time to assemble a valuable collection of originals. Foreshadowing the later fate of cast collections, Romantic artists since the early 19th century had associated the white and often fragmented plaster copies with death; casts were specters. And indeed, a few decades later the casts’ reputation generally started to decline. This was as much due to changing aesthetics in the arts as to socio-political circumstances. In the U.S., for instance, the economic elite in an increasingly stratified society tried to distinguish themselves from the masses through defining the objects and venues of “high art.” Fragments of ancient originals belonged to this category, but clearly not plaster casts. From a place of “cultural democracy” the museum turned into a site of “cultural hegemony” (Stephen Dyson). 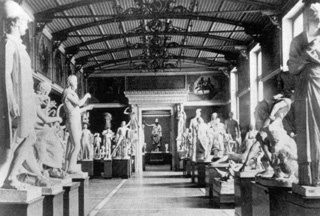 Whether seen as dead bodies, cheap replicas or dusty specimens, the casts were no longer awarded any artistic value. Their removal seemed an act of liberation from an overcome canon and educational ideal or from societal constraints, culminating in happenings and the student revolution of the 1960s. Since the 1970s we witness an ongoing re-evaluation of plaster cast collections all over the world. The devastating effects of wars or of the polluted environment raised the awareness of cast’s documentary value. Cornell’s collection, for example, owns casts the originals of which suffered substantial damage through weathering or perished entirely in the bombings of World War II. In colonial contexts, cast collections are starting to get valued as part of local, if “white” heritage. Also from an aesthetic point of view, casts have become attractive again. The idea of artistic genius and originality appears as an invention of the 19th century. Contemporary artists and cultural theorists alike have embraced the idea of copies, simulacra or works without authorship. Finally, the cast collections’ didactic value still holds. As a sort of “textbook in 3D and 1:1” they remain unsurpassed.